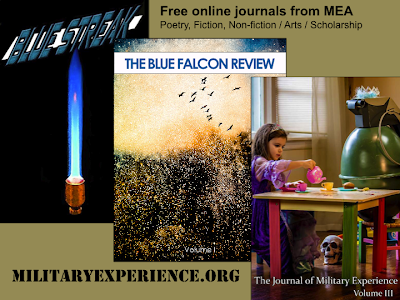 Military Experience and the Arts, a Kentucky-based non-profit organization, has launched three new or rebooted journals of military-themed non-fiction, fiction, and poetry. Starting this week, each is available free online as Portable Document Format (P.D.F.) files. 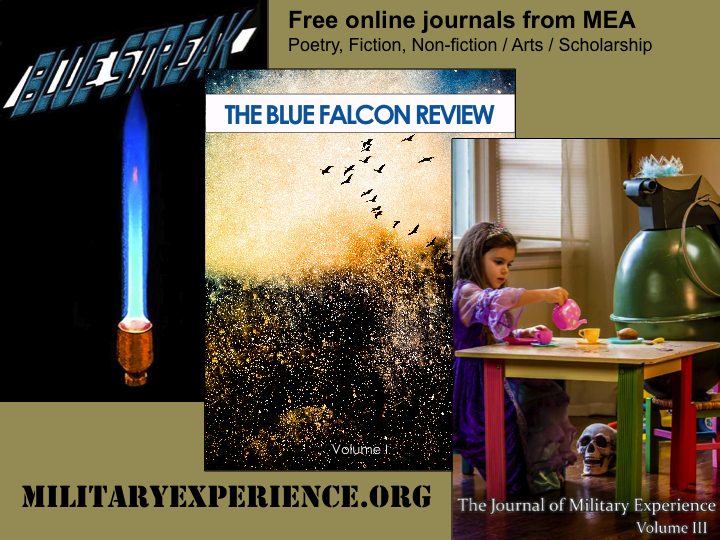 A third volume of The Journal of Military Experience (Click for PDF). The 377-page publication has been retooled to focus on literary non-fiction, visual arts, and academic scholarship, having spun off poetry and fiction into separate vehicles. The 105-page inaugural issue of the Blue Streak poetry journal. The 75-page inaugural issue of The Blue Falcon Review features 11 short works of fiction. Working through collaborative e-mail and social media groups, the organization operates as a virtual writing workshop, and relies heavily on nationwide networks of volunteer peer-editors. Each publication welcomes submissions year-round. A fourth journal regarding Post-Traumatic Stress Disorder (P.T.S.D.) topics is anticipated to launch later this year.